A tax hike of 5-6% of GDP doesn’t sound like much. But that’s a big tax hike if your baseline is 19% — it means that everyone’s taxes go up by about a third….These aren’t little adjustments. They’re huge changes in the overall tax burden, and they will have big effects on peoples lives, and the economy. This is an example of how our choice of language has a huge impact on how we think about taxes. Raising taxes by a third really does sound like a lot. But let’s take a look at what that really means. Page 65 of this CBO document provides estimates for how much income tax various people pay. The median family gets dinged for 3% of its income. 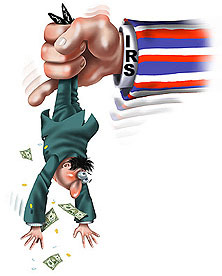 A one-third increase means their income taxes would go up by….1% of their income. That’s not so much. How about a family with twice the median income? That is, someone who’s pretty well off. They pay 13% of their income. A one-third increase means their taxes would go by 4% of their income. Again, this is far from catastrophic, especially since we’re talking about an increase phasing in over the course of many years.